The Wall Street Journal and others want the right to bargain collectively with Facebook and Google. The titans’ dominance of the $83 bln U.S. digital ad market is a concern, but not just for print media. Combating it requires antitrust enforcement, not an industry carve-out. 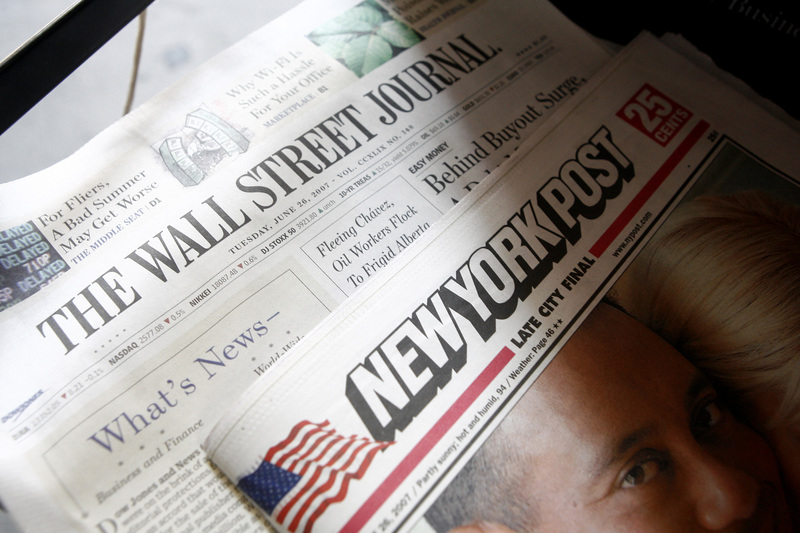 Copies of the Wall Street Journal and the New York Post are pictured in a newsstand in New York, June 26, 2007. News Media Alliance, a trade association representing nearly 2,000 U.S. news organizations, on July 10 called on the U.S. Congress to allow publishers to negotiate collectively with dominant online platforms Google and Facebook. “Legislation that enables news organizations to negotiate collectively will address pervasive problems that today are diminishing the overall health and quality of the news media industry,” David Chavern, president & chief executive of the News Media Alliance, said in a statement. Together, Facebook and Google represent about 60 percent of U.S. digital advertising revenue forecast at $83 billion this year, according to research firm eMarketer.